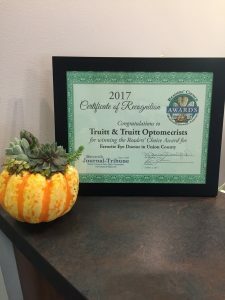 Thank You to all our wonderful patients for once again voting us Marysville Journal Tribune’s Readers’ Choice for Eyecare in Union County. We are honored by the trust you put in us. The entire team at Truitt & Truitt strives to give you not only excellent care, but also a fun and friendly experience. Thanks for showing us the love!! !